Happy Sunday! I hope that you all had a wonderful Thanksgiving holiday. I definitely enjoyed #allthefood and have zero regrets because it was all so yummy. This week was a little busy with the holiday but I still managed to get in all of my workouts. Here’s how the week went for me. I went back to the Monday night kickboxing class and it didn’t disappoint. It’s such a good workout and makes me realize that I have a lot of work to do when it comes to endurance! I love this class because it’s a total body workout. I always leave sore, but satisfied. 3 mile run + ActivMotion Bar workout. This was my first workout with the ActivMotion Bar and I really enjoyed it! I have the 10 lb bar so I did a quick upper body workout. If you’re interested in trying it out, they are running a huge holiday sale right now. You can get 40% off with code bf2018. It wasn’t just cold, it was cold AF! The “real feel” was around 3 degrees. I thought about bailing on the race but I only get to wear my turkey costume once a year so decided to go for it, lol. This was our first time running the race but it was pretty good and well organized too! While I had originally planned to #OptOutside, the real feel temperature was -1 when I woke up in the morning. I just couldn’t deal with 2 days in a row or running in those temps so I opted for the treadmill. I got in a quick Peloton spinning class before heading down to Washington, DC to spend the weekend with friends. We went to this awesome restaurant called Filomena for dinner and it was SO good. The restaurant was also really festive and decorated for the holiday. Rest Day and enjoying Washington, DC with my friends! On Thursday I earned the “Frosty” badge on my Garmin because I ran in below freezing temperatures lol. I literally couldn’t feel my feet for the first half mile of the race. It was pretty brutal. Also on Thursday night I felt like this after eating but I have no regrets. Next weekend is Rock n Roll San Antonio. I’m sure I’ll get through the race but my training could have been better. Oh well, I’m not running it for a PR anyway so no big deal. I’ve never been to San Antonio so I’m excited to see what the city has to offer. I’ll also be on the hunt for a good BBQ restaurant as well, lol. How was your week? Did you have a good Thanksgiving holiday? How’s the weather in your part of the country? I noticed I got the frosty badge on my Garmin recently too! It wasn’t quite as cold here, but the real feel was in the teens. Great job getting in all your workouts this week! When I first saw the badge I was like what is this?? I didn’t even know that Garmin was doing badges now lol. Thanks! I do like to run in the costume. Yeah I can see myself using the ActivMotion bar a lot more, it’s really cool and my arms were definitely feeling the burn! Oh I love your costume!!! And the hoody is great, too. Brilliant week for you! Ha, that squirrel meme is perfect as is your turkey costume! I am not ready for those cold temperatures, crossing my fingers that Chicago is spared for a few more weeks! OMG that squirrel meme was SO me on Thursday. I felt like I could just roll off the couch lol. Can I say how much I loved your turkey costume? OMG, you look so cute!!! I’m interested in hearing more about the AcivMotion bar. Are you going to do a recap? LoL thanks Wendy! I love that so many people like the costume even if I look a little crazy wearing it. I’m going to do a recap about the ActivMotion bar next week so stay tuned 🙂 It’s really a cool device. What?! You were in D.C. and didn’t tell me?! Filomena is pretty near my office. Looks like I should check out their holiday decor — and menu! I’m not sure I would have braved the weather for that Turkey Trot but your costume is AMAZING! Nice swag too! Your costume is adorable! It probably help you stay warm. I love the hoodie you received as part of the race swag. I wish more races would do that. We have enough T-shirts already. You should at least enjoy some warmer temps in San Antonio next week. It’s a great city with a lot to offer. Have fun and good luck at the race! Thanks for linking. Thanks Holly! I only get to wear it once a year so I’m glad so many people enjoy it, lol. The hoodie we received for the race is awesome, and it’s pretty good quality too! I’m looking forward to San Antonio this weekend but hope that it’s not too warm! It’s a really cool device and they are having a pretty good sale right now – ends today I think! Haha! Love the squirrel picture. That’s how I felt after Thanksgiving, too. I was definitely glad for my stretchy pants that day! You had a nice variety of workouts this week. Seems like your running is going well. Congrats on the Turkey trot! LoL thanks Laurie! I definitely could have rolled off the couch after Thanksgiving dinner on Thursday. The temps on Thursday were just ridiculous! Your turkey costume is too cute – and how cool that they gave out hoodies for a 5K. That’s some very nice swag! Right?! It was just beyond cold and I wasn’t ready for it yet, lol. I’m glad the temps are back to normal this week. 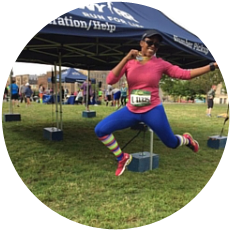 The hoodie that we got for the 5K is pretty good quality – I was super impressed! Great job getting out there (in the cutest Turkey costume) for a Thanksgiving race! Its colder in NY/CT than Minnesota, that’s crazy! Awesome job fitting in so much fitness with the holidays, very impressive. Oh, San Antonio! That should be fun. You do a lot of the Rock n Roll races! Thanks Jessie! I really enjoy wearing the costume every year for a turkey trot. We’re kind of back to more “normal” late Fall temps now but those two days last week were just bitterly cold! A great mix of workouts for the week! I love that turkey costume! And what a great finisher hoodie for your Turkey Trot! You guys had way colder weather than us in Philly, I can’t imagine a real feel below zero just yet! I hope you have a great time in San Antonio, I look forward to hearing how it goes! I was so impressed with the finisher hoodie for the race, and it’s pretty good quality too! Thanks – I’m hoping San Antonio will be a lot of fun. It was definitely brutal last week & I have no regrets about not #optingoutside, LOL! Now, maybe if my trot had a hoodie — then again it’s free & low key & that’s why I do it. Or used to. You look so cute in your turkey costume! Did it help keep you a little warmer? I also forgot to say enjoy San Antonio! It’s such a fun city. Miss it! Thanks Judy! I’m excited to go there this weekend. Our Thanksgiving day was nice, and I got out for a run before the meal. I couldn’t pass up that weather, especially since we were getting lots of wind over the weekend. If I had waited for Friday or Saturday, I would’ve been miserable! I was fully stuffed on my way home after the meal, and I enjoyed every bite. Congrats on racing in that weather! Our turkey trot was unusually warm…by which I mean barely below freezing. I was only cold because I planned to volunteer in the tent but got sent outside, lol. There is a restaurant in San Antonio that makes 3 lb cinnamon rolls – last time I was there it was called Lulu’s Cafe, but they have changed names before, so I hope that’s still right! Also check out the riverwalk (your race might go through it?) – it’s the touristy area but it’s pretty. Thanks Hannah! Luckily the costume kept me a little bit warmer during the race. So great that you volunteered for a turkey trot! OMG thank you for the restaurant recommendation in San Antonio. I cam definitely going to look into that! Love love the turkey costume! So great that you got out there despite the cold. Also, how cool to get a hoodie. Wish more races would do that. Hope you had a lovely holiday! I agree – I wish more races would give out hoodies. Actually anything besides a t-shirt would be great! Thanks Farrah! I hope you had an amazing time in Hong Kong! Love your costume. A hoodie for a 5k? That’s awesome. I wouldn’t have skipped mine. Was it hilly? I ran the Pelham half on sat and it was the hilliest race ever!!! The 5K was a little hilly and it had some pretty steep inclines. I don’t think I noticed it too much because it was so cold outside lol. Hoodie for a 5K is nice swag! It’s cold in GA, getting down to 28 tonight! Good luck in San Antonio! Oh wow that is cold for GA! The weather is cold but dry right now. We could use some snow and I really hate it when it’s cold but theres not even some snow to make it worth being cold haha. So hopefully we get some soon. Three degrees???!!!! What?? Your turkey costume was on point, though! I love it! You had some really great workouts this week. I love that you are able to combine so many different cross training activities with your runs! I am loving all of your pictures! Great outfit for the Turkey Trot too 🙂 Also, that sweatshirt is awesome, I need to come join you next year!! Yes come join us for a turkey trot. They are so much fun! That turkey costume! LOVE IT! The weather here in Myrtle Beach has been crazy. I kid you not, it’s 70 degrees one day, 35 the next, back to 70, back to 35. I wish it would pick a lane…I don’t know how to dress! Wow those are some major extremes in the weather! Girl that is COOOOLLLDDD! But your outfit was adorable! I am loving my actimotionbar! It is so much fun (and challenging) to use! Glad to hear you had a nice Thanksgiving! It has been a bit crazy with the weather here in Houston. I wake up to 30 degrees, but by early afternoon it warms up to the 60s. Hope you have a great time in SA! I did that half a few years ago and it was fun! Thanks Esther! The weather was certainly not that much fun but I’ll take cold over heat any day! I’m looking forward to leaving for San Antonio in a few days! I’ll be sure to try to visit that restaurant too. Cute costume. You’ll enjoy running in and around san antonio for RNR. I lived there for 10 years and whenever I go “home” I run there. Make sure to enjoy the food. I am definitely going to try to enjoy all of the food this weekend!